The Make Up Fairy's Fairy first birthday party was hosted at Lillies Bordello last Friday, November 29th. 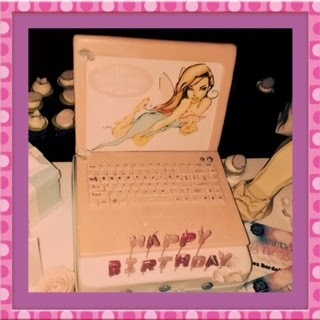 The cake for the event was beyond fabulous, in the form of a laptop shape, and showing the Make Up Fairy logo. Naturally enough, the cake was surrounded by, yes, you've guessed it, dozens of delicious fairy cakes! You can see the fabulous blogging and makeup artistry of the Makeup Fairy by visiting her Facebook page or website.